Anniston Regional Airport (IATA: ANB, ICAO: KANB, FAA LID: ANB), formerly known as Anniston Metropolitan Airport, is a city-owned public-use airport located five nautical miles (6 mi, 9 km) southwest of the central business district of Anniston, a city in Calhoun County, Alabama, United States. It is included in the National Plan of Integrated Airport Systems for 2011–2015, which categorized it as a general aviation airport. 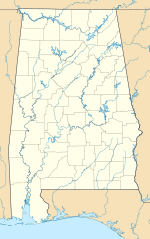 Anniston Regional Airport covers an area of 596 acres (241 ha) at an elevation of 612 feet (187 m) above mean sea level. It has one runway designated 5/23 with an asphalt surface measuring 7,000 by 150 feet (2,134 x 46 m). For the 12-month period ending April 30, 2012, the airport had 33,644 aircraft operations, an average of 92 per day: 71% general aviation, 15% military, 14% air taxi, and <1% scheduled commercial. At that time there were 32 aircraft based at this airport: 50% single-engine, 31% multi-engine, 6% jet, 6% glider, and 6% ultralight. Anniston Metropolitan Airport was the intended destination of GP Express Flight 861 which crashed about 7.5 miles (12.1 km) northeast of the airport on June 8, 1992. ^ a b c d FAA Airport Master Record for ANB (Form 5010 PDF). Federal Aviation Administration. Effective January 5, 2017. ^ "2011–2015 NPIAS Report, Appendix A (PDF, 2.03 MB)" (PDF). National Plan of Integrated Airport Systems. Federal Aviation Administration. October 4, 2010. Archived from the original (PDF) on 2012-09-27. This page was last edited on 22 August 2018, at 19:15 (UTC).